With a history dating back to nearly 5000 years or even more, the present day India introduces itself as a tourist destination, perfect for learning about various civilizations. Further, several spiritual leaders and founders of many popular religions of the contemporary times dwelled in country’s various region. India’s authentic wealthy trove of culture, crafts, mysticism, art, philosophy, tradition, music and architecture has been luring travelers, scholars and history buffs across the globe from long past. Relish the experience of exploring the country’s ancient relics and architectural ruins rising over teeming cities, streets and roads. This is a land of a huge contrast where tradition and modernity mingle to offer mind-boggling memories that will retain in the mind for a very long time..
A prince named Siddhartha Gautam (Lord Budhha) came here to attain Nirvana in the sixth Century B.C. ; Mahabodhi temple is the holiest destination of Buddhists. Not only Buddhists, but millions of Hindus from around the globe visit this temple to pay their homage to Lord Budhha. This temple of historical and cultural importance is honoring the Gaya district of Bihar since 260 B.C. The sacred Bodhi tree dwelling in the complex of the temple is believed to be a spot where Buddha used to meditate for transcending the cycle of reincarnation. Thus, it is looked as the holiest spot in the complex. Buddha’s place of meditation, next to the Bodhi Tree, is acquired by Buddha statue on polished sandstone, which was installed by Emperor Asoka in the third Century B.C. This heritage site of India has several places where Lord Buddha meditated after attaining complete bliss. According a temple website, there is site in the premises where he stood meditating for a week without moving his eyes. Mahabodhi Temple is a UNESCO’s World Heritage Site. Timings: 5 a.m. until 9 p.m. Camera: 20 INR, and 300 INR for video cameras. The meditation park is open from sunrise until sunset. The entry fee is 20 INR for visitors and 25 INR for the ones who meditates. Individuals longing for quintessential Mughal architecture should head to Delhi’s Humayun Tomb – one of the most popular heritage destinations of India. Humayun was son of the first Mughal Emperor of India. Haji Begum, Humayun’s Persian wife, looked after the construction, which began in 1569 (fourteen years after Humayun’s death). The tomb stands in the centre of a square garden, and causeways (charbagh) separate this Mughal Tomb into four main gardens. Further, there are water-channels in the centre. You can enter this enclosure through two majestic double-storied gateways situated on the west and south. Inlaid tile work, carvings comprising both Indian and Persian decorative elements, and carved stone screens – are a few highlights making Humayun Tomb wonderful. When it comes to magnificent heritage holidays, exploring the glorious complex of the Red Fort is must. Constructed as the palace fort of Shahjahanabad, which is the new capital of Shah Jahan – the fifth Mughal Emperor of India, Red Fort keeps on narrating the majestic power and pomp of the emperor. The Red sandstone walls of the huge Red Fort (Lal Qila), which are 33-m high were constructed in 1638 to prevent the entry of the invaders. The main gate – Lahore Gate – gets immersed in the freedom celebration and draws a major crowd on every Independence Day. The hemispherical dome of Chatta Chowk, a market (bazaar) attracts tourists with a huge variety of items. Chatta Chowk extends to a large fort compound, consisting wonderful collection of huge buildings, including the Drum House, the Pearl Mosque, the Hall of Public Audiences, Royal Baths, Palace of Color and the white marble Hall of Private Audiences. An evening sound and light show allows spectator to relive India’s history associated with the fort. A courtyard with a capacity of 25000 devotees, Jama Masjid located in Old Delhi is the largest in India. It was constructed between 1644 and 1658 and is Shah Jahan’s last architectural opus. This extravagant mosque possesses three great gates, four towers and two 40 m-high minarets. With intricate carvings and verses of the holy Koran etched, the walls add to enhance the beauty of Jama Masjid. The cabinet in the north gate has a collection of Muhammad’s souvenirs – the Koran written on deerskin, a red beard-hair of the prophet, his sandals and his footprints, which are embedded in a marble block. Famously said by many – ‘Elegy in Marble’, Taj Mahal or the Crown Palace is the grave of Shah Jahan’s beloved Queen, Mumtaz Mahal. The beauty of this Palace exceeds all other material beauties, which is heightened with the Jamuna River, which flows near it. To meet the expectation of the Emperor, 22 years (completed around 1953) and around 20000 workers travailed to construct this magnificent construction in Agra, Uttar Pradesh, standing on an elevated platform, which forms unequal octagon. Taj Mahal intricate detailing engraved on the walls lets India’s travel and tourism shine worldwide. What interest most historians and archeologists are the complex geometrical patterns incorporated in to the designing of the colossal Palace. The main central dome is large and four more domes surround the main one. There are four tall minarets that have taken up the four corners. Everyday a vast multitude of travelers scout this place, which has become a pleasure for all the people on earth. Location: Located in Agra, U.P. approx 200 kilometers (125 miles) from Delhi. 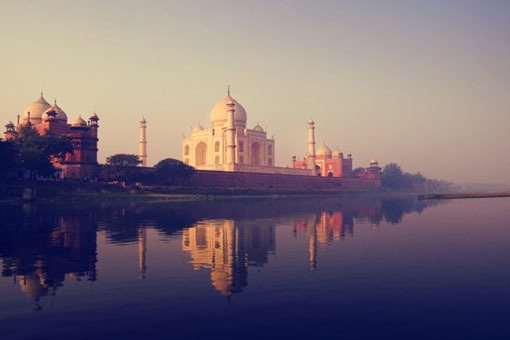 It’s a famous city of India’s popular Golden Triangle tour. Entry Fee: 750 INR (Foreigners), 510 INR (Citizens of SAARC and BIMSTEC Countries), 20 INR (Indian), free entry for children below 15 years of age. Built in 1192 to depict the beginning of Islamic rule in India – Qutub Minar stands 73m high, is a tower of victory as the building’s construction was commenced by Qutub-ud-din-Aibak right after he declared his victory over the last Hindu kingdom in Delhi. The Qutub tower is made up of distinct storeys, and each has a projecting balcony. The diameter of the storeys decreases gradually when measured from top to bottom – 15 m diameter at the base to just 2.5 m at the top. Red sandstone heightens the beauty of the three stores, while the fourth and fifth storeys are beautified with marble and sandstone. The ground floor of the tower is a Quwwat-ul-Islam Mosque, which is considered as the first mosque to be constructed in India. An interesting fact to know – The inscribed letters over the eastern gate explain that the Qutub Minar was constructed with the material incurred after destroying ’27 Hindu temples’. Qutub Minar in Delhi is one of the renowned heritage tourist places of India. It is visited by several tourists every year. Satiate your desire of exploring ancient relics by exploring the pompous group of monuments at Hampi, Karnataka. There are several Dravidian temples and palaces were constructed during the 14th and 16th centuries and are of big vitality for both historians as well as architects. This spot was declared as World Heritage Site in the year 1986. Heritage holidays at Hampi are heavenly because tourists get to witness larger than life size statues of god, positioned every quarter of a mile. Other wonderful spots of the place are Virupaksha Temple, Hazara Rama Temple, Vithala Temple, Queen’s Bath, Singaradu Hebbagilu, Ugra Narasimha, Lotus Mahal, and the ruins of Achuta Raya Temple. Entry Fee: 10 INR for Citizens of India and visitors of SAARC and BIMSTEC Countries, 250 INR for others and no entry fee for children up to 15 years. If you wish to relive the time in which land of India got wealthy with some beautiful architectural marvels that were constructed during the Chalukya dynasty (Indian royal dynasty, ruled big areas of southern and central India between the 6th and the 12th centuries), then head to Pattadkal, a small town, famous for its ancient temples. Pattadkal is located in Karnataka, was once the second largest city of the Chalukyas. It was a place for Chalukyas Coronation. The temples in Pattadkal, a World Heritage Site, are constructed in Rekha, Nagara, Prasada and the Dravida Vimana styles. The oldest temple is Sangamesvara, constructed by Vijayaditya Satyasraya (AD 697-733). The other famous temples are the Kadasiddhesvara, Jambulingeswara both belonged to 7th century A.D. while Galaganatha temple is a century later in the style of Rekha, Nagara, and Prasada. The Kasivisvesvara temple was the last to construct early Chalukyan style. The Mallikarjuna temple by Rani Trilokyamahadevi was built basically to cherish the victory over the Pallavas by Vikramaditya II. She also supported the construction of Virupaksha temple inspired by the architecture of the Kailasanatha temple at Kanchipuram. However, the last temple built at Pattadakal was during the reign of Rashtrakuta ruler Krishna II (9th century A.D.). The temple is locally renowned as Jaina Narayana. Entry Fee: INR 10 for citizens of India and visitors of SAARC and BIMSTEC Countries (Bangladesh, Nepal, Bhutan, Sri Lanka, Thailand and Myanmar), INR 250 (Others) and children up to 15 years can enter without any fee. Travel 46 km northeast of Bhopal to get refined in Sanchi, where brilliant Buddhist monuments are honoring the big Indian state – Madhya Pradesh. On your heritage holidays in India explore this oldest Buddhist sanctuary, which was a major Buddhist hub in 12th A.D. This holy centre comprises several complex structures of the renowned Buddhist legends. Besides, there are also several monolithic pillars, temples, monasteries, palaces and most of them are built in1st and 2nd centuries A.D. In this plethora of monuments, a world renowned monument that gets highlighted because of its beautiful and massive dome is the great Stupa. It was constructed by Emperor Ashoka. Entry Free : INR 10 for citizens of India, US $ 5 for foreigners and children up to 15 years can enter without any fee. Kamasutra cravings embracing the Khajuraho’s three groups of temples are among the amazing temple art in the world. Situated in the state of Madhya Pradesh in India and about 1000AD year old; the temples of Khajuraho were constructed during the Chandella Dynasty. In these temples, you will also get to appreciate the marvels of Jain and Brahman monuments. It is the sheer beauty and architecture of these monuments, which made them UNESCO world heritage site.Out of 85, only 22 managed to survive. In most of the monuments, sandstone of various colors is the main element of construction. All the monuments have entrance, hall, vestibule and a sanctum, and fresh air and proper light can enter from huge windows of the temples. There are western region, eastern region and southern region of the Khajuraho. In the western part, you will find Kandariya Mahadeo, Chaunsat Yogini, Lakshamana Temple, Vishwanath Temple, Chitragupta Temple and Matangeshwara Temple. On the eastern part of Khajuraho, marvelous temples that can be spotted are Adinatha Temple, Brahma temple, Vamana temple, Ghantai Temple, Parsavanatha Temple and Javari temple. In the southern part, explore the Duladeo Temple, and Chaturbhuj Temple.The Khajuraho Dance Festival is organized every year in the first week of February (1st to 7th). Through this festival, the visitors can relish an opportunity to get introduced with various classical Indian dances. Entry Fee: 10 INR for Indians, US $ 5 for foreigners and children up to 15 years can enter without any fee. To explore an amazing architectural site, you have to go deep into Maharashtra’s Aurangabad to get introduced with the mesmerizing Ajanta and Ellora Caves, snugged in the Sahyadri Hills. The cave shrines date back to 2nd century BC is created by then skilled artisans with their hands. Being one of the popular heritage places around the world, the caves are accepted as an excellent example of ancient Indian architecture. The 34 caves at Ellora were chipped during the 350 AD to 700 AD period showcase the three religions – Hinduism, Buddhism and Jainism. While the 29 caves at Ajanta were carved during a period from 200 BC to 650 AD describe the story of Buddhism. Ajanta Caves – 10 INR for Indians, US $ 10 for foreigners and children up to 15 years can enter without any fee. If you wish to witness one of the largest observatories in the world, head to Jaipur. Jantar Mantar, amalgamation of religion, science and art, is a name of the five huge buildings situated in Jaipur, New Delhi, Ujjain, Varanasi and Mathura. This magnificent structure was constructed in 1720; it was a time when Jaipur was the seat of Maharaja Jai Singh II. Jaipur’s observatory is the biggest of all the five observatories and one can also find a huge sundial here. The Jantar Mantar houses various architectural and astrological instruments that have captured the interests of astronomers, historians and architects round the globe. The astronomical observatory in Jaipur has fourteen major geometric devices that help in detecting time, identifying the constellations and, even for analyzing the orbits around the sun. Renowned buildings inside the Jantar Mantar are the ‘Samrat Yantra’ – world’s largest sundial, the ‘Hindu Chhatri’, the ‘Jaiprakash Yantra’ and several other geometric structures with astronomical devices to examine the ‘universe’. Entry Fee: 40 INR and 15 INR for Indian tourists and Indian students respectively, 200 INR and 100 INR for foreigner tourists and foreigner students respectively and children up to 15 years can enter without any fee. Renowned worldwide for rock carvings and monolithic sculptures; UNESCO World Heritage site at Mahabalipuram was a port of Pallava Empire in 7th century. These monuments will let you have a glimpse of sculptures and carvings showcasing then artisans’ creativity and craftsmanship. Out many temples, a lavish shore temple is bordered by Nandi bulls, facing the sea, offers fascinating site to the visitors. This temple was established again stone by stone after it was ruined in a cyclone. The appeal of Mahabalipuram is packed not only in its monumental architecture but the charm of the place can be felt through its glittering sand beach, wonderful handicrafts and stone-carved items that are exhibited for sale near the shore. Various sculptures of Mahabalipuram have inspired those in Cambodia, Annam and Java. Visiting Hours: Open from 6 A.M. to 6 P.M. Entrance Fee: INR 10 forcitizens of India and visitors of SAARC (Bangladesh, Nepal, Bhutan, Sri Lanka, Pakistan, Maldives and Afghanistan) and BIMSTEC Countries (Bangladesh, Nepal, Bhutan, Sri Lanka, Thailand and Myanmar), US $ 5 for foreigners and children up to 15 years can enter without any fee. Fatehpur Sikri adds a scintillating feather on the hat of India’s Travel and Tourism industry. This Mughal architecture lures thousands of tourists every year in Uttar Pradesh. Situated 26 kms away from the main city of Agra; this monument was constructed by Akbar to pay homage to a great Sufi saint. The architecture of Fatehpur Sikri has true Indian character. The walls of monument posses versatile Indo-Muslim composite style designs, which are a fusion of composite cultures. Entry Fee: 10 INR for citizens of India and visitors of SAARC (Bangladesh, Nepal, Bhutan, Sri Lanka, Pakistan, Maldives and Afghanistan) and BIMSTEC Countries (Bangladesh, Nepal, Bhutan, Sri Lanka, Thailand and Myanmar), US $ 5 for foreigners and children up to 15 years can enter without any fee. Situated on the bank of the Bay of Bengal, embracing the rays of the glistening sun, the temple at Konarak represents sun god Surya’s chariot. Chariot’s 24 wheels are graced with beautiful designs and it is headed by six horses. Constructed in the 13th century, the temple is one of India’s most famous Brahman sanctuaries and portrays the grace, the joy and the rhythm of Kalinga life. Explore this beautiful Indian heritage spot in Orissa to get amused with the decorations such as small patterns in bas-relief performed with great precision and also huge free standing sculptures of animals and humans. Gracing the land of Amber with its magnificent presence – Amer Fort was constructed in 1592 by Raja Man Singh. The beauty of red sandstone and marble building gets enhanced with the presence of Moatha Lake. The architecture of building showcases both Hindu as well as Muslim architectural designs. The fort comprises of Shila Devi Temple and Ganesh Pol – a gate leading to the private palaces. There are several pavilions, halls and other popular attractions to entertain your senses. Visit here to retain it in your mind for long – Jaisalmer Fort is one of the many heritage tourist places that will easily capture your attention. Explore this fort to get acquainted with different aspects of its own gracious heritage – Epitome of Indian artwork and military magnificence. Wonderful foundation of this fort is set in the middle of the sandy terrain of the Great Thar Desert. Made of yellow sandstones; the fort is built by Raja (King) Jaiswal on the top of the Trikuta Hill in 12th century. 250 feet tall fort surrounded by fortified walls of 30 feet and 99 bastions for guns depict the planning of the king against the attack. You will surely relish the fusion of Rajput and Islamic architectural styles that are quite visible in this fort. Do not miss to appreciate the beauty of Ganesh Pol, Akshya Pol, Suraj Pol and Hawa Pol. Visiting Hours: Early morning till 5 P.M.
Heritage holidays in India can get magnificent when you explore the largest fort of India – the Chittorgarh Fort – a place holding great importance in the history; wonderful palaces and destroyed walls will explain you about the bravery of numerous warriors. Spreading on an area of 700 acres and extends up to 3 kilometers in length on a high hill near the Gambheri River in Chittorgarh; this massive fort has 65 medieval structures, 4 palace complexes, 19 temples, 4 war memorials or the stambhs and 22 water bodies. This first hill fort of Rajasthan is believed to be constructed by Mauryan rulers and Sisodiya clan of Rajputs during the 7th century AD. Chittaurgarh Fort invites numerous travelers every year who wish to get mesmerized majestic history that let them spend some time in seclusion to contemplate over the heroism of Mewar rulers. Drive 84 kms north of Udaipur in the wilderness to explore the splendid Kumbhalgarh Fort, cradling in the Aravali Ranges the fort. This fort was built in 15th century AD by Rana Kumbha, and the fort temporarily dwelled by Mewa rulers in the times of strife. It is of great significance for the people as it is the birthplace of – Maharana Pratap, Mewar’s legendary king. From the fort one can have superb view of the surroundings. The fort’s huge wall extends some 36 kms with a width enough to tackle any attack. In the 19th century, the fort was renovated by Maharana Fateh Singh. The fort’s complex has ruins that hide great history.